Every aspect of modern life has been shaped by the ideas of ingenious inventors, many of them tinkering away in small workshops or even their garden sheds. 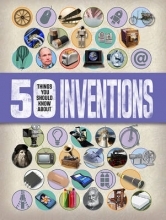 Packed with facts and figures, discover the masterminds behind some of the world's most incredible inventions. Clive Gifford is an experienced writer and editor of children's books and a sporting all-rounder. He has become established as a writer of non fiction children's books through projects with OUP, Kingfisher and DK amongst others. Clive has enjoyed playing and watching cricket from an early age. He has played for his ultra-casual side, The 'strollers, and has become an avid member of the Primary Club for cricketers who have been out first ball!